For those keeping score at home, construction on the Regional Connector Transit Project is about a third of the way complete. The next major phase of construction starts September 8 when crews will remove the existing road surface of Flower Street from 5th to 6th St. and install decking, or a temporary roadway. This work requires a series of weekend street closures that will last through December. While Angeli, the tunnel boring machine, is responsible for mining the majority of the new underground railway, a process known as “cut-and-cover” will connect the new tunnels from 4th St. to the 7th St/Metro Center Station. With the cut-and-cover method, the street pavement is removed, the tunnel is dug, and once the tunnel box is complete the street is restored. Temporary road decking allows excavation to proceed while traffic is maintained on the surface. In this location crews will be digging 60 feet below ground. In order to install deck panels, weekend closures of Flower St. will start Friday evenings at 7 p.m. and last through 5 a.m. Monday. The closures will continue every weekend for three months (excluding holidays). Keep in mind this closure coincides with the existing 6th St. closure at Flower St. Recommended detours include Grand Avenue for southbound traffic, Hope St. for northbound traffic, and Wilshire Boulevard for eastbound traffic. Local and pedestrian access to businesses will be maintained for the duration of the closures. During the closures you’ll notice crews saw cutting, removing roadway, installing piles, excavating, protecting utilities and installing temporary deck panels. Noisier activities such as saw cutting and roadway removal, will take place during daytime hours. 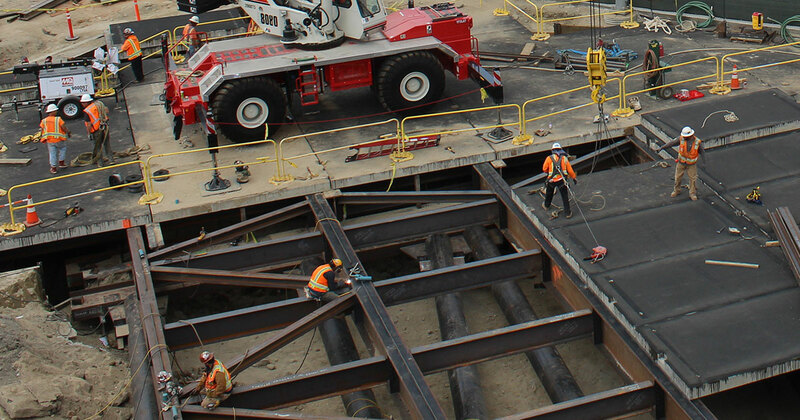 Once decking operations are complete, thru-access will be restored and all construction activities will take place underground and behind barriers. Semi-permanent barriers will be in place for the duration of tunnel box construction until 2020. Flower St. decking will be completed during the first quarter of 2018 when crews reach just south of 6th St. where the existing Blue Line rail ends. While all this is happening, work on the second tunnel will begin and excavation on the future Historic Broadway Station will continue. By next year, the Regional Connector will be halfway built.